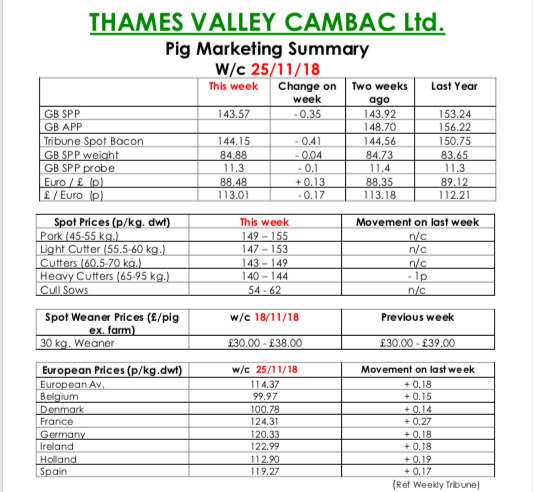 This week’s Pig Marketing Summary from Thames Valley Cambac reported that demand from the majors was healthy, with special focus on Freedom Food numbers. Unfortunately, this was at the expense of Red Tractor supplies. This is leading to a back log of Red Tractor pigs with only 4 full killing weeks left before the Christmas period. Average slaughter weights are increasing, tracking over a kilo up on last year. Prices were similar, with only one processor reducing their contract contribution by a penny. The fresh meat market was a touch quieter – uncomfortable for this time of year, but prices stood on. There was stability in the sow market with all prices standing on. In Europe, prices were reported as static, and all quotes in sterling appreciated slightly due to a stronger Euro that ended the week up 0.13p at 88.48p. The Weaner Marketing Summary, for week commencing November 18, reported that market conditions continued to be poor with little demand for any supplies outside contract arrangements. Prices reflected this, with some quotes well below cost of production. The prices announced by the AHDB saw no quote give for a 30kgs pig and the weighted average for a 7kg fall by £1.75 to £35.31.